Pray for your child to have teachers who will challenge and motivate him in the learning process. 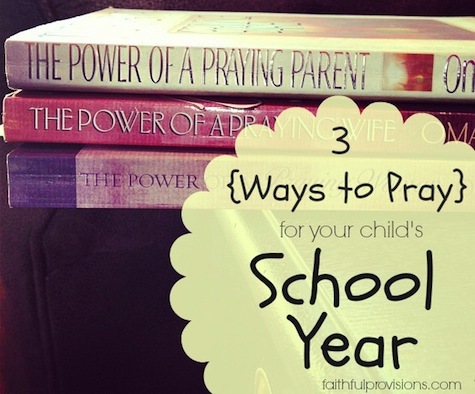 Once teachers are assigned, make it a point to pray nightly with your child for his teachers–by name. School is not always fun and games. After the initial “welcome back” phase wears off, students must be ready to apply themselves with diligence. Ask God to help your child stay motivated, giving her a vision that keeps her focused over the long haul. First, pray for your child to be the right kind of friend. Remind him that as Christians, we best express our faith through our love for others–especially those most unlovable! Then, ask God to provide healthy relationships for your child’s daily connections. Homeschooling moms have a similar list of needs. Remember, the teacher you are praying for is yourself. Don’t neglect that. You may also want to enlist a couple of praying friends to add you to their prayer lists as you begin this new year. Pictured above you’ll see three of my favorite prayer resources from author Stormie Omartian. What’s your biggest concern for your kids as they head into a new school year? How will you be praying for them? I’d love for you to share your thoughts. Oops! I hit the wrong buttone when trying to correct and error. I was finishing by saying that I am praying for peers who will invite him into their world, and a new buddy who really understands him. He has had a true friend for several years. This friend has been in his class almost every year and was to be again this year; however, his parents have decided to homeschool him. On a good note: I have seen God’s faithfulness every year so far, so I just know that He will hear my prayer.